Self-Contained Handheld Flame Thrower Seems Like A Great Way To Light Up | OhGizmo! By David Ponce on 11/11/11 • Leave a comment! What could possibly go wrong? This flame thrower (which you can see in action in the below video) was created by an Instructables user called PDRWLSN. While he titled it “Moose/Bear Repellant”, we’d like to think of it as the most exciting way to burn off some eyebrow hairs while lighting a cigarette*. 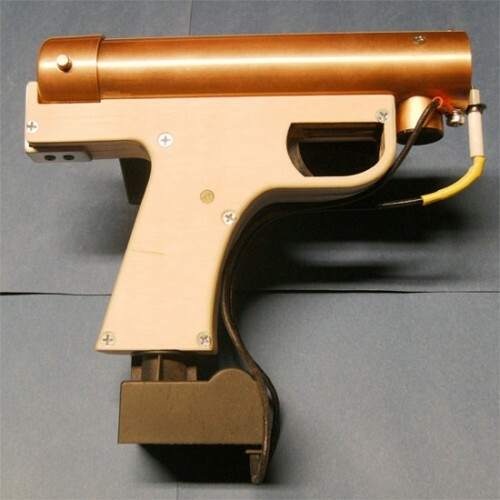 See, it’s a gun-shaped device that contains “various bits of copper tubing, plywood, some laser-cut acrylic parts, butane, and the pulse-ignitor from his gas grill to start the fire burning.” It throws a flame about a foot and a half in length and could easily be misused in a thousand different ways. Best part? He was kind enough to give us detailed instructions on how to make our own (Instructables… get it?). * Don’t be an idiot and point this at any face, ya?